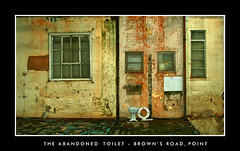 Abandoned toilet, Browns Road, Point. By Vanessa Cracknell. One of the first posts in photo colleague Vanessa Cracknell’s new blog is to do with her fascination with the Point in Durban. It is an area which is undergoing a rapid transition from being extremely run down, to becoming a sought-after residential and business area. Rot and decay exist side by side with new structures and, to be fair, Vanessa isn’t the only one fascinated by it. The area has received a lot of photographic attention and one of the highlights has to be the abandoned toilet, as shown in Vanessa’s picture, above. Great blog. Thanks for featuring my photo of the infamous toilet!